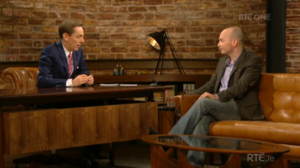 The final Late Late Show until September. It’s a charidee dance special! Dermot Bannon will be dancing Bollywood style for Barnardos; Majella O’Donnell will be doing the jive for Arc cancer support; George Hook will be doing the Charleston for the IRFU charitable trust and Maria Walsh will be doing the salsa for Bumbulance. Also on the show will be a tribute to Bill O’Herlihy featuring ‘the three amigos’ – John Giles, Eamonn Dunphy and Liam Brady – plus many of Bill’s colleagues and friends. 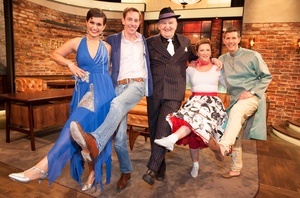 Top from left: Maria Walsh, Ryan Tubridy, George Hook, Majella O’Donnell and Dermot Bannon. Posted in Misc and tagged Late Late Show at 3:47 pm on May 28, 2015 by Admin. I’m impressed they got Al Capone though…. I was but will go out now.. christ on a bike. Seriously, how many times have those guests already been on either the LLS or that other muck on Saturday night? Revolvin’ favours keep revolvin’. I’m going to need to borrow someone’s revolver and a bottle of whiskey. What state does your life have to be in before you would watch this? I mean at the risk of being overly dramatic, we’re on this earth for a blink of an eye and if you can’t summon the energy to experience something else you might as well have been born a slug. I might watch it. It can only be explained as a sort of masochism, that’s part of the Irish psyche. 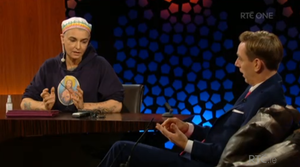 I sometimes watch the Angelus too and if I’m feeling extra masochismitical I’ll watch RTE’s Sunday mass. Or Nationwide. Glenroe used to have the same effect too, oh and Fair City. Can’t really explain it. Can we leave Nationwide out of this please? If liking that is wrong I don’t want to be right. Anyway of course I respect anyone’s decision to watch TV ideally suited to a resident sitting smoking in the day room of some sort of institution. I just never thought it would be you Anne. If you need rescuing just leave a candle in the top window. Ah Nationwide’s not too bad I suppose. And thanks, you’ve a heart of gold so you do. You’re not a Limerick woman are you? That humour..it can only be from this town. If you are, I’m sure I know you! ha Sorry, no need to answer.. But cmere, is that the only song you know? You posted that for eh.. Frilly I think it was last night..
I’m not from Limerick but I’m very fond of the place. I knew I liked you..
You can’t take any chances with these folk, Joe. Shurrup or I’ll stab ye with my handbag..
Are the two on the right small or far away? Did anybody else think that was Des Bishop on the right? Just me? Yeah…. I think that’s that architecture muppet. He’s on Room to Improve, About the House or something or other. Or is that Duncan what’s his face? Anyway watched him – Des Bishop’s twin, one time convincing this couple to fork out their good money on some manky design feature.. a steel beam or some sort a shite. Gobpoo. A quick burst of an AK-47 would do it. I feel like jumping off dun laoghaire pier.